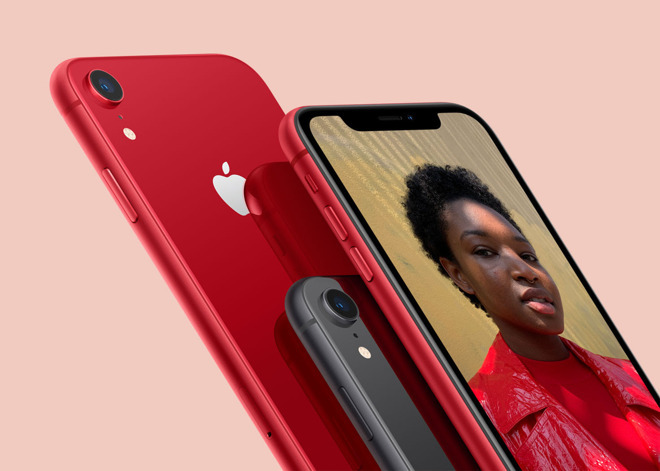 A sequential decline of 18 percent in January was similar to a 20 percent decline a year ago, and the overall smartphone market was down 4 percent month-over-month versus 10 percent during the same period in 2018, said UBS' Timothy Arcuri in a note to investors seen by AppleInsider. January "non-Android" shipments were down 70 percent year-over-year. "The data would suggest that Apple's price adjustments to offset the currency impact are not yet having much positive impact on iPhone units," Arcuri wrote. He suggested however that February and March will be "more important indicators" in light of the Chinese New Year holiday. The festival began on Feb. 5, and typically involves gift-giving and extended holidays, somewhat akin to Christmas in the West. The new information isn't affecting UBS estimates, which call for a 4.4 percent decline in Apple's fiscal 2019 revenues and a $185 stock target. Arcuri reaffirmed a "buy" rating for the company. Because of weak iPhone sales, Apple's December-quarter Chinese revenues fell 26.7 percent year-over-year to $13.17 billion. The product has taken a beating mostly because local vendors like Huawei are selling competitive phones that cost hundreds of dollars less. Compounding matters has been a strong U.S. dollar, a weak Chinese economy, and the effects of the U.S.-China trade war. Chinese performance has dragged down the company has a whole. Some forecasts suggest that iPhone sales may not return to growth territory until this fall, when 2019 iPhones should ship. DJT started a trade war. Apple is collateral damage. Sad. Got to agree. I think the Chinese government had established an atmosphere where it is unpatriotic to buy foreign products. In the past, buying high end products would be a status symbol. Now having an iPhone may have negative connotations especially when working with government officials. I don't know if China has imposed any additional import duties on these products as well. Weren't online retailers claiming iPhone sales were up like 50% after the price slash? Consider more affordable iPhone, Apple. Yes, that is the issue... not a trade war and Chinese gov’t ‘nudging’ its citizens toward homemade products. Get a new narrative. The trade war hasn’t helped but it isn’t the only thing harming sales. The trade war is creating nationalism driving the purchase of local brands. But, it’s also creating economic headwinds. Even people with the disposable income aren’t inclined to purchase luxury items when they can’t predict/create financial expectations. The other consideration is cost vs. value. I think the iPhone X sales through off Apple’s predictions on what the market could bear. Apple predicted higher 8 sales vs X (incorrectly) so they adjusted upwards with the XR and XS. Unfortunately, the X, XR, XS are bleeding edge in features and that’s reflected in cost. There is little actually need for FaceID and AR, so there is little incentive to upgrade. FaceID was going to be the future anyways, but the costs to implement it probably should have gone down first before making it standard across the product mix. Apple is pushing AR hard, which probably drove the FaceID decision, but the reality is AR is currently as sales gimmick (like AI on a phone). It’s basically worthless for 99.95% of the phone buying population. The other article on LEGO AR ghosts is the perfect example. It’s probably pretty cool for a 4 year old, but how many of those have iPhones? If you live in China, I’ve heard activation of a new phone gets registered through government. So buying Apple is more complex than buying Starbucks coffee. Is that true? Does that lead to greater purchases of Chinese brand phones? This is not how things work for foreign companies. They have to export and reimport and pay duty. Even if this is a paper exercise. What they always let out is that Apple's not the only one. Samsung is in a worse shape in China. I remenber them selling their phones just under the name galaxy a couple of years ago. China doesn't like South Korea, so even Samsung's name is a problem. You look at the Top 5 vendors and besides Apple, there is no other foreign company. I'm also pretty sure apple got there more because it's a Status Symbol than because people who can afford it enjoy it more than other brands (high end offerings). I say that because this whole part of the world just has different taste in Software (Design/ Colors/UI), just look at the most popular apps they use. Of course apples ecosystem also played a role but I'll stand by the status symbol argument. And shouldn't the effect of any currency fluxuations be minimal because they are mad there? Trump should impose a 50% Tariff on Cell phones made in China. And keep raising it till manufacturers set up shop elsewhere. Preferably US and Mexico. Luxury and premium brand products made in China "for export" are not sold at lower prices in China. If you work in a company with Chinese employees that travel to the US you will quickly learn that one of the first things they will want to do when visiting the US is to go shopping for luxury and premium Chinese/Asian made products, especially clothing and gadgets. In essence they are repatriating products back to their point of origin at a greatly reduced prices compared to what they experience at home. Doesn't make sense but this is exactly what I have witnessed on many occasions. With the trumpytariffs this situation may have changed a little. In my opinion, the biggest driving factor in iPhone sales in China is the buying sentiment of the affluent portion of the Chinese middle class. Like many affluent buyers they have a lot of price flexibility, especially when optimism is high. The 2018 iPhone price increases on their own would unlikely have caused any heartburn whatsoever. But the price increases coupled with the continued animosity between the current US executive branch and the Chinese leadership has cast a cloud over buying sentiment that will take an extended period of time to recover from. These Chinese buyers are not clones who follow the party line. They have as much distain and pessimism for the current political BS (on both sides) as do their affluent middle class American peers. Until the chaos and stupidity is toned down and markets allowed to follow more natural and market-driven dynamics they will sit on the sidelines and hold their cards. Don't forget that Apple is a luxury / premium brand with a heavy dependence on buyers who have a lot of price flexibility and willingness to buy when they feel optimistic. The drastic reduction in optimism is what's hurting Apple's iPhone sales, not the token increases in product prices. You need to realize that a 50% tariff is nothing but a tax put on consumers...in your case Americans. Apple produces 40-80 million iPhones a quarter and these are largely made by hand with complex supply chains. There is not enough able workers to do this type of work in the United States. So a tariff would just be a tax that will hurt consumers and put Apple employees out of work due tondecreased sales. Their production is never coming back to the States. Maybe the MacPro or a few marque items with production runs in the tens or even hundreds of thousands but not the iPhone.